Mother Nature’s Diet FAQs – MND and motor neurone disease. Is there a connection? 1: Mother Nature’s Diet, you guys call it MND, but that stands for motor neurone disease, right? 2: Are there any links between Mother Nature’s Diet and motor neurone disease or the UK charity The Motor Neurone Disease Association, the MNDA? 3: Are you recommending Mother Nature’s Diet as a suggested dietary protocol for people suffering from motor neurone disease? 4: Are you selling supplements to help motor neurone disease sufferers? No, Mother Nature’s Diet is in no way at all linked to, authorised by, affiliated to or connected with The Motor Neurone Disease Association. Mother Nature’s Diet is not designed as a dietary protocol for sufferers and we do not sell supplements, or anything else, to people suffering from motor neurone disease. Motor neurone disease is a rare progressive condition that attacks and damages the nervous system, leading rapidly to weakness, muscle wasting and sadly, often to a fatal end. Motor neurone disease is a very serious neurodegenerative condition, the precise causes are not fully understood and there is currently no known cure. Motor neurone disease is often fatal within two years of diagnosis, it affects approximately 5,000 people in the UK at any one time. MND in known as ALS – amyotrophic lateral sclerosis – in the United States. MND and ALS are the same disease. According to the NHS, motor neurone disease affects around 2 in every 100,000 people in the UK each year, and according to the MNDA, every day six people in the UK are diagnosed with the disease, and six people every day die from the illness. According to the NHS, motor neurone disease can affect adults of all ages, including teenagers, although this is extremely rare. It’s usually diagnosed in people over 40, but most people with the condition first develop symptoms in their 60s. It affects slightly more men than women. The Motor Neurone Disease Association is the only national charity in England, Wales and Northern Ireland focused on motor neurone disease care, research and campaigning. The MNDA is a membership organisation with over 9,000 members, with over 7,000 active volunteers in England, Wales and Northern Ireland and around 170 paid staff, all dedicated to improving the lives of people affected by motor neurone disease, now and in the future. The charity’s admirable vision is of ‘A world free from motor neurone disease’ and it does all it can to enable everybody living with MND to receive the best care, achieve the highest possible quality of life and to die with dignity. 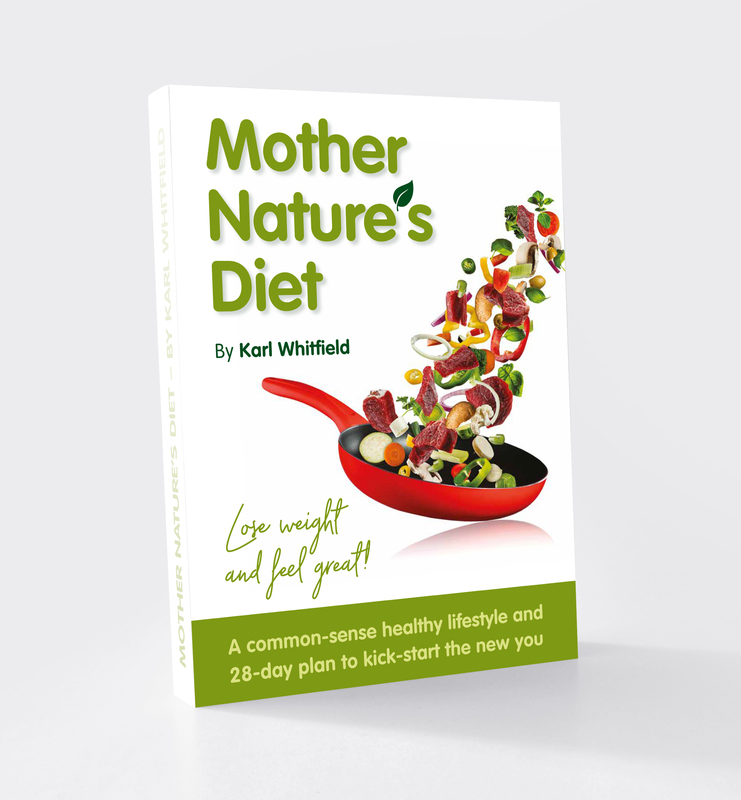 Mother Nature’s Diet was started by me, Karl Whitfield, in 2010, and it really started as little more than my personal blog. I transformed my own life through learning about nutrition, learning to eat properly, adopting a more active lifestyle and quitting some of my bad habits, such as smoking. This all resulted in over seven stones of weight loss, I came off my prescription medications for skin conditions and a nasal condition, and I had loads more energy. So many of my friends and family kept commenting on how good I looked, and asking me ‘what are your secrets?’ that I started a personal blog to document my journey and share my learning. I called this blog Mother Nature’s Diet because to my mind, all I had done was to get back to treating my body the way it should be treated – more activity, and a diet of water and fresh whole foods. At the time, the initials MND never crossed my mind! I never imagined this would grow to become my life’s work, my passion and my obsession, and I certainly never imagined this might grow to become a business, something I now actively promote to the public. I was writing Mother Nature’s Diet, not MND. The initials MND were not part of my daily vocabulary back in 2010 or 2011. Over time, my blog gained popularity, and Mother Nature’s Diet expanded onto social media, and in no time at all I had 10,000 followers and they all started calling it MND – every day I would receive messages and emails from people saying things like “I’ve started eating MND and I have lost 20 pounds – thank you!” or “I suffer from chronic fatigue syndrome and I have been eating the MND way and I just wanted to tell you that I feel the best I have felt in years…I shall stick to MND! Thank you!” and this kind of thing. I started running a Closed Facebook Group for people following Mother Nature’s Diet and every day those people called it MND in their every communication. No one (apart from me) ever bothers to write out Mother Nature’s Diet, they all just call it MND. In 2014, when Mother Nature’s Diet evolved and became a business, we launched MND Community Membership, a paid subscription community for people following Mother Nature’s Diet. Please note that MND Community Membership has nothing at all to do with motor neurone disease, it is not directed at people suffering from the condition and we do not in any way target sufferers to try to sell membership. Obviously, here at Mother Nature’s Diet we are fully aware that MND as a set of initials stands for both Motor Neurone Disease and also Mother Nature’s Diet. We have the greatest of respect and empathy for motor neurone disease sufferers and we completely respect the great work of the MND Association, and of course it is absolutely not our intention to interfere with that work in any way, nor affiliate ourselves to the MNDA by association of the name, nor any such thing. To the best of our knowledge, there is absolutely no conflict of interest between what we are doing, promoting a healthy lifestyle through all-natural nutrition and regular exercise, and the work of the MNDA with motor neurone disease sufferers. We have absolutely no desire nor intention to promote what we do to motor neurone disease sufferers, we are not attempting to sell anything to motor neurone disease sufferers, we are not promoting anything to sufferers and we have nothing to gain in any way by using these initials nor trying to affiliate ourselves to the MNDA. Mother Nature’s Diet is not selling any ‘snake oil supplements’ or false promises. We simply advise people to eat fresh whole foods, shun unhealthy lifestyles, and exercise regularly. Clearly, sufferers of motor neurone disease are not our target market, we stand to gain nothing by capturing any “MND” web searches or any such thing, and we represent a very natural healthy lifestyle, nothing insidious or unhealthy that could do anyone – a motor neurone disease sufferer or anyone else – any harm. Mother Nature’s Diet is a healthy diet and lifestyle that should prove suitable for everyone, but we make no specific claims or promises that this diet and lifestyle can in any way help motor neurone disease sufferers. Please check our Medical Disclaimer for more. At Mother Nature’s Diet we wish only to help folks find better health and fitness, and we have no commercial interest at all in trying to exploit the initials MND in any way. We offer our respect to motor neurone disease sufferers and our support to the excellent work of the MNDA. ← Mother Nature’s Diet FAQs – Is it healthy to drink coffee?